I remember the day when the remains of our dear departed colleague Velupillai. Kandasamy, a fellow striker, were taken in a massive procession of workers from the General Hospital, Borella to the Fort Railway Station. 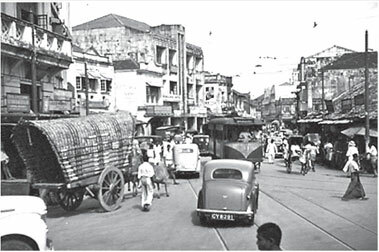 The route along McCallum Road (now Wijewardena Mawatha) was thronged with crowds. Workers from offices, factories and workshops from the capital and its suburbs - Ratmalana and Kolonnawa had joined the vast concourse of people to pay their homage to a martyr, a government clerk who hailed from Jaffna. The coffin was borne aloft by strikers. In batches they took their turn as pall-bearers. Kandasamy's final journey began on the train to Jaffna. There was not a single constable in uniform to be seen along the route. On 5th June a procession of several thousands of strikers, for which permission had been duly obtained, was proceeding with N. M. Perera at its head, when a large force of police barred its passage at Dematagoda and baton charged the strikers. The LSSP leader was knocked down and beaten while on the ground. The police also fired 25 rounds into the demonstration: one killed and 18 injured, including Percy Nanayakkara. (Thereafter he earned the endearment, "Mundaya", and had to endure life-long a pellet embedded in his body, close to his spine. Medical specialists advised against surgery to remove the pellet). The cruel act of repression by the police had roused the resentment of the working class. There was Walpola Rahula Thero standing tall in a jeep; directing the crowds. It was an unforgettable sight! (Personal recollection of T. B. Dissanayake, then an audit clerk, 21 years of age. From 1958-64 he served as president of the GCSU). The General Strike of May-June 1947 is one of the most significant events in the history of working class. It was the biggest strike organised up to that time. At its height fifty thousand workers in the public and private sectors participated in the strike. At the head of the strikers stood the Public Services League (PSL), Ceylon Federation of Labour (CFL) and Ceylon Trade Union Federation (CTUF). It was the mass rally at Galle Face Greeen that set off a wave of strikes. Leading members of the PSL who addressed the meeting were interdicted by the colonial government. The organised workers came out in their thousands. Government clerks came out on strike under the leadership of the GCSU. This was the first time middle class, employees had joined workers in industrial action. Sir Henry Monck-Mason Moore who was Governor of Ceylon (1944-48) referring to these events in a published article on his tenure, states: "In 1946 an attempt was made by the Clerical Service to engineer a general strike in preparation for the general election under the Soulbury Constitution ... It illustrated the unwillingness of the Board of Ministers to face upto to their responsibilities. Despite the threatening situation, they were conspicuous by their absence. I was in Kandy at the time and Mr. George E. de Silva urged me to take immediate action. I went to Colombo and met the Ministers, who all urged me to declare a state of emergency and exercise dictatorial powers. Somehow or other they had come to know of the existence of such an instrument, though it was highly secret. "I then pointed out to them that they had full powers to pass legislation of the same character in the State Council and that if they considered the time had come to take such action it was their plain duty and responsibility to take the necessary action themselves. If they did so I would of course support them in every possible way and they could base their legislation on the draft in my possession. Eventually they did so, and indeed provided more severe penalties than in the original draft in my possession. It was quite obviously an attempt to leave me holding the baby if such strong action was criticized." British Governors of Ceylon by H. A. J. Hulugalle, ANCL, Lake House, Colombo, 1983, p.232. Government workers struck on 15 October. The railway strike soon extended to the Harbour, the Gas Company, Colombo Municipality and various private firms. According to the official figure, 24,000 had stopped work. But the real figure was about twice as large. The government refused to negotiate. Many establishments, were at a standstill. A central strike committee was formed consisting of representatives of the participating unions and parties to give effective leadership. When the stoppage continued the Acting Governor of Ceylon on 21 October agreed to meet a deputation of the Government Workers Trade Union Federation (GWTUF). A delegation went to Queen's House to meet the Acting Governor but refused to come to a settlement in the absence of the LSSP leader Dr. N. M. Perera, who had been arrested by the police. It was Pelis Serasinghe, the Govt. Factory workers' leader who insisted that the LSSP leader should be released in the first instance. In the end Dr. Perera was released. He together with the workers' deputation negotiated a settlement of the strike. The Government made several important concessions. But some of the promises were not honoured and workers joined the second General Strike the following year. Prins Rajasooriya (later secretary of the CFL) who also joined the strike, was then attached to the Petrol Control Department. He recalled that I. J. Wickrama (who became a leader of the GCSU in the 1950s and 1960s) standing on an office table, addressed the strikers. K. M. Karunaratne who also became a GCSU president later, was attached to the Puttalam Kachcheri then, joined the strike. Last but not least, I would like to mention that Richard Adhihetty, now 86 years old, then attached to the PWD, was also a participant. Many victimised workers joined the campaign trail during the 1947 elections. They actively supported left candidates. "The wounds of the strike have been healed but the scars remain", as one leader reflected. In a reference to the 1947 incident at Dematagoda, Premier S. W. R. D. Bandaranaike said, "The shot that killed Kandasamy sounded the death knell of British Imperialism!"